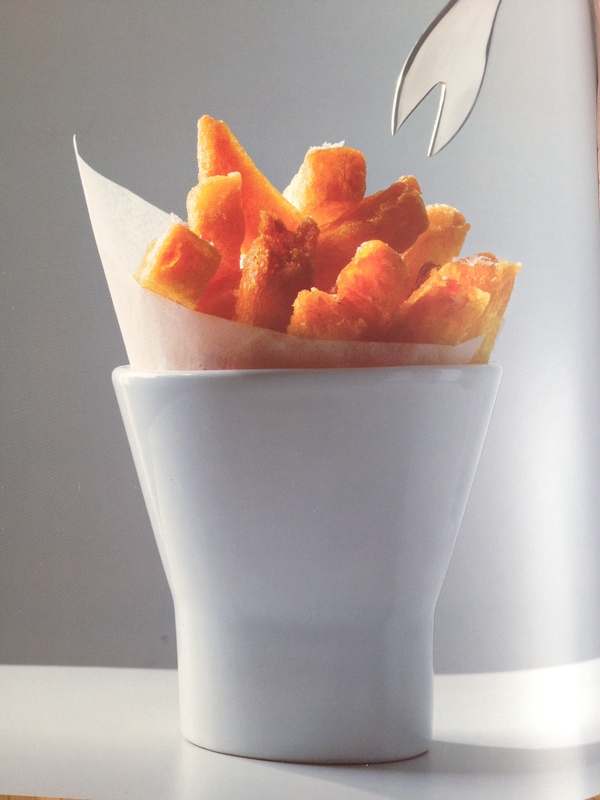 On a trip across The Pond last year, I was lucky enough to try the chef’s signature dish of Triple Cooked Chips at Dinner by Heston, which features a wonderfully nerdy menu dedicated to an historical exploration of British gastronomy. While you can find truly excellent fries in much more accessible locales than a restaurant overlooking Hyde Park, the Triple Cooked Chips I had that night will stand out in my memory forever. And so, when my brother gifted me a signed copy of Heston Blumenthal at Home, the very first dish I tackled clearly needed to be the Triple Cooked Chips. When you set about to recreate a chip recipe that takes a minimum of 5 hours but only requires an active cooking time half that, you have some time on your hands to contemplate potatoes. As it turns out, there is much to contemplate. So, first order of business: how are chips different from french fries? Are they different than french fries? The short answer is yes! there is a difference. The longer answer is that while a french fry is not a chip, a chip could be considered a sub-category of french fry. The most elemental description of both chips and french fries are the same. They are both skinless, deep fried potatoes. While french fry is a general term that could refer to a whole host of different cuts and dimensions (shoestring, cottage, curly, crinkle cut, waffle, steak, etc.) a chip is a much more specific thing- while chip sizes do vary slightly, they are always a thick cut- sometimes they closely approximate a steak fry, but they are typically shorter and more squat. This distinction is very important, because the dimension of the cut will determine the surface area and, ultimately, the texture of the finished product. In this case, the cut of the potato and the technique are a study in textural contrasts and yield a fluffy, pillowy inside incased by a uber crunchy and golden outside. If done properly, the outside almost shatters when you bite into it. After some careful contemplation on dimension and surface area, I transferred my ruminations towards types of potatoes. Starchy or floury potatoes have a lower moisture content and lower sugar content. They yield a fluffy texture when cooked. 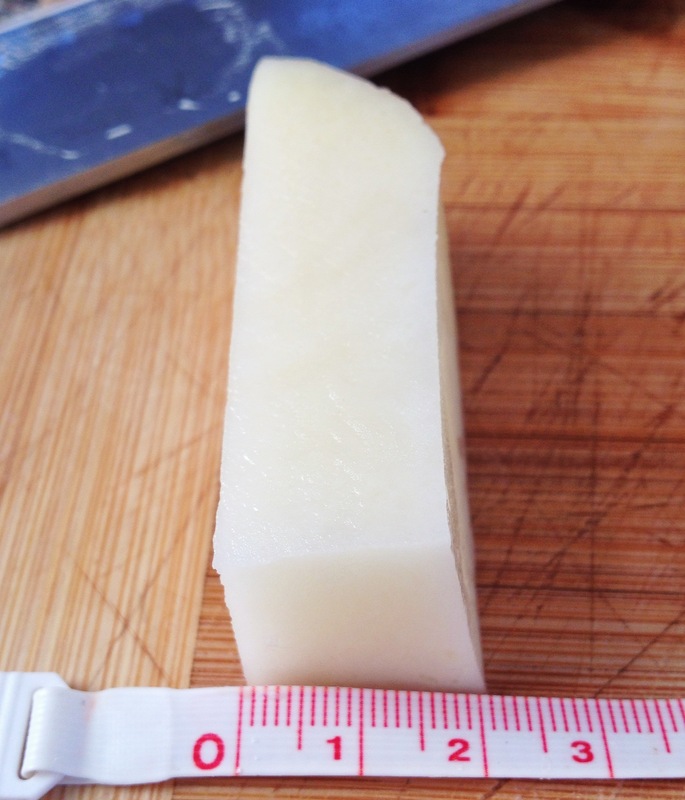 Waxy potatoes have a dense, smooth texture and higher water and sugar content. 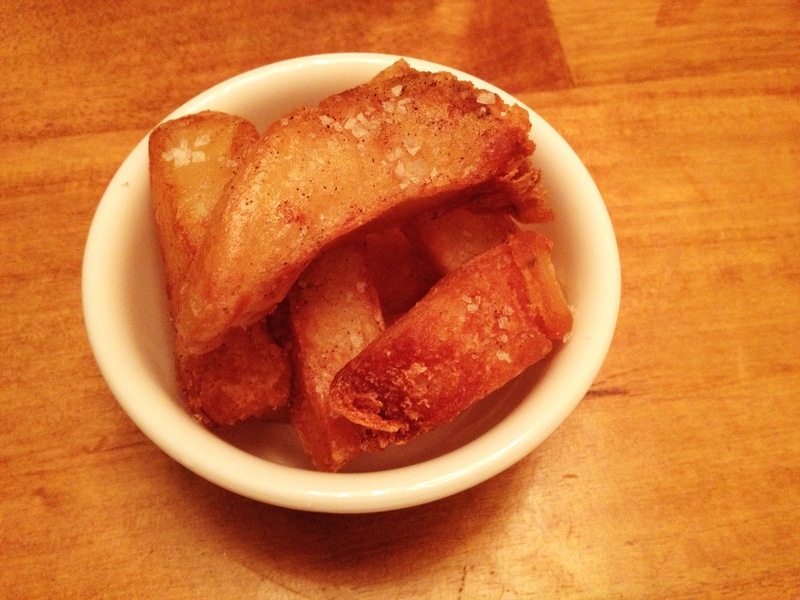 For our french fried potato purposes, starchy is the way to go. Chef Blumenthal’s recipe called for Maris Piper potatoes, which I had never heard of and have no access to. Some internet sleuthing suggested that Russet (aka Idaho potatoes) or Kennebecs would be worthy substitutes. I decided to use both Russets and Kennebecs in a side-by-side comparison. I was happy with both and saw negligible difference in the end product. Lastly, I had a brief dalliance contemplating types of oils. Chef Blumenthal had recommended using grapeseed oil, which has a relatively high smoking point and is neutral, meaning that it will not impart any flavor to the finished product. I decided to do once batch with a neutral oil and the next day to try a batch with duck fat. (I happen to have a freezer full of duck fat for occasions such as this.) Duck fat is not neutral, but it is also not overwhelming. It added a really nice richness to the finished dish. note 1*I believe that beef tallow would elevate the level of deliciousness to the stratosphere. note 3: please don’t ever fill your pot more than half way with oil when you are deep frying. 2.Wash potatoes under running water for 5 minutes to remove as much starch as possible. 3.Fill pot with cold water. Add potatoes. Bring to simmer over medium heat and cook until potatoes are almost falling apart, about 20-25 minutes. 4.Carefully remove potatoes from water and dry on paper towels. Quickly transfer potatoes to a container (it’s ok to stack them on top of each other) and place in freezer for a minimum of one hour. 5.Heat pot of oil or fat to 130 degrees celsius (266 fahrenheit). Fry potatoes in small batches until a light golden crust forms, about 3-5 minutes. 5.Transfer chips to paper towels and blot well to absorb excess oil. Return chips to container and freeze for one hour. (Chef Blumenthal notes that at this stage if you don’t want to serve the chips the same day, you can keep them in the fridge for up to 3 days before finishing the cooking process). 6.Heat oil or fat to 180 degrees celsius (356 fahrenheit) and fry chips in small batches until evenly golden brown, about 5-7 minutes. Garnish with sea salt and serve immediately. The Taste-Clearly these chips are the epitome of deliciousness. That said, it really is their texture, and not their taste which make them stand out: crunchy, fluffy perfection. The Process– If you don’t have a deep fryer (which I do not) achieving and maintaining the correct oil temperature is a bit of a challenge. Other than that, this is a pretty straightforward recipe that yields a really superior product. 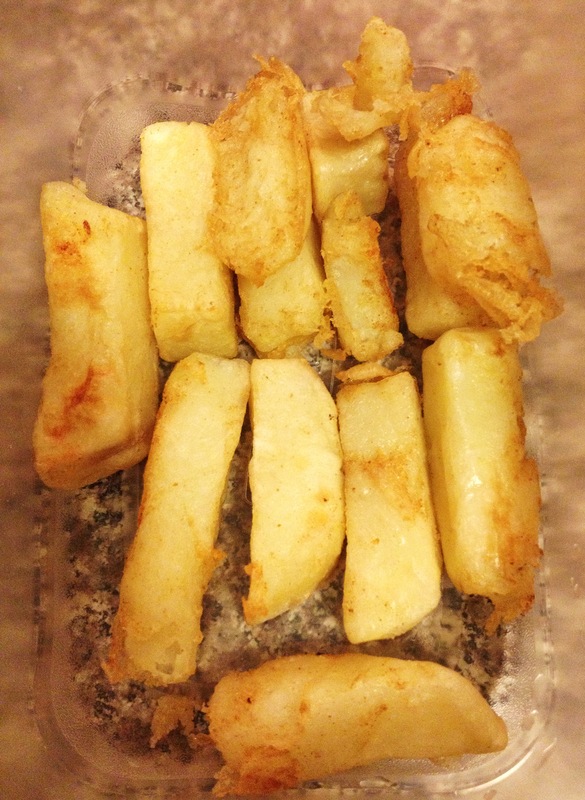 Remarkable that the chips do not seem worse for wear despite the triple cooking – delish!